I love soups from the east – miso soup, ramen, pho and more. Chef Ilan Hall, who you may know as one of the first winners of Top Chef, or his Brooklyn restaurant The Gorbals where he films the show Knife Fight, is a chef who likes to challenge himself. Knife Fight often includes ingredients like pigs head or live catfish or lamb belly or shark. Not exactly veg friendly. But he recently opened Ramen Hood in one of my favorite food places in LA – Grand Central Market. Ramen Hood is no ordinary ramen place – the dishes are vegan. He makes mushroom broth that is meaty, creamy, spiced with togarashi, filled with ramen and topped with a faux soft boiled egg – yes a faux egg. I have yet try to try Ramen Hood but I have been craving it already. 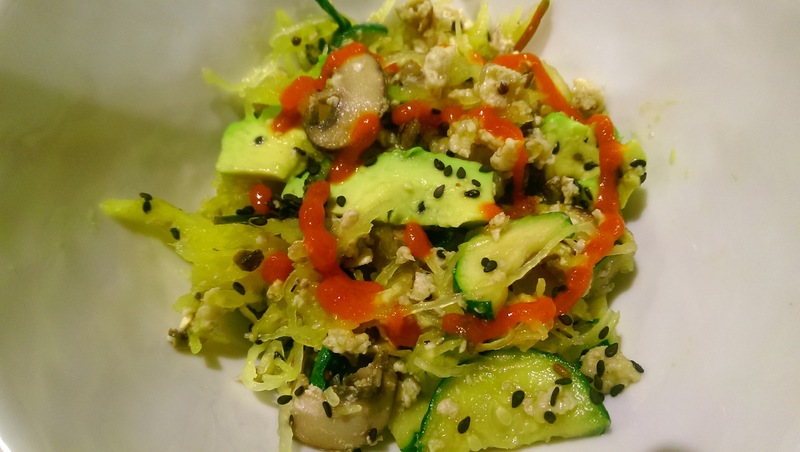 While on the Whole30 I have been unable to eat some of my favorite soups as they contain ramen, or rice noodles or soy – fermented or fresh. So I decided it was time to make my own mushroom based, asian-inspired soup, with bok choy and spaghetti squash for noodles. I haven’t figured out a faux-egg yet, so I topped with with a real poached egg. The result was earthy, flavorful and hit the spot.